When it comes to luxury amenities, our Springs studio apartment homes are second to none. Each home includes upscale features such as generous walk-in closets, designer appliances and private entries. Our studio apartments are ready to receive your own personal touch. We'll get you started with a list of some of our favorite finds that are decorative, functional or both. Side tables often take up a lot of space relative to their useable surfaces. Sofa sleeves turn the arm of your couch into a functional tabletop that accommodates beverages, remote controls and other items. Bonus: use part of the space you saved for a sleek floor lamp with an attached reading light. Take multitasking to a whole new level with a lift-top coffee table. Not only does the table contain hidden storage space, the top lifts up to serve as a computer station or workspace. Dish drainers usually come in a standard rectangular shape that takes up a lot of countertop real estate. A corner dish drainer makes better use of space and stands on end out of the way when it's empty. 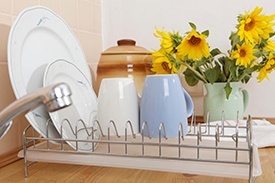 Pair it with a coffee mug drying rack/organizer and you'll never have to put dishes away again! Utilizing vertical space is the best way to add room to any apartment home. Over-the-faucet shelves are a simple but clever way to keep kitchen or bathroom products accessible without cluttered countertops. They come in various styles from contemporary to country chic that fit any decor scheme. This is one of those ideas that is so brilliant and so useful you wonder why you didn't come up with it. The pockets keep bath and shower accessories close at hand, while the mesh construction allows air drying to prevent mold and odors. Give your mattress and box springs a finished look for a fraction of the cost of a formal bed. These headboards come in a wide range of finishes and feature shelves, cubbyholes and cabinets to use for storage or display. This amazing cabinet serves as both storage and a command center for your home. It features roomy shelves, hooks for coats and purses, a full-length mirror and a large cork board for notes and messages. With its compact size and small turning radius, this cabinet can replace several individual pieces. Don't underestimate the difference a little greenery provides. Houseplants combine esthetic beauty with some surprising health benefits ranging from purifying air to improving memory retention. Share your best tip for decorating studio apartment homes in the comments!